A bushy evergreen plant; 1-2 feet high, once widely cultivated for medicinal uses, it is now grown mostly as an ornamental shrub. The plant consists of several square, branched, downy stems which are woody at the bottom and bear opposite, entire (toothless) sessile, glabrous to hairy, linear-lanceolate leaves that have a peppery scent when stroked firmly. The rose-colored to bluish-purple flowers (1/2 inch) grow in successive axillary whorls at the tops of the branches and stems from June to October. Zones 3-10. Not heat-tolerant. Prefers full sun and warmth but will accept some light shade. Prune back severely in winter or early spring. Other varieties: Blue giant hyssop or anise-hyssop (Agastache foeniculum) is anise scented; White-flowered cultivar (A. snow spike); Korean anise hyssop (A. rugosa); Mexican giant hyssop (A. mexicana); and yellow giant hyssop (Agastache nepetoides) has saw-toothed leaves; A. alba has white flowers; and A. rosea has pink flowers. 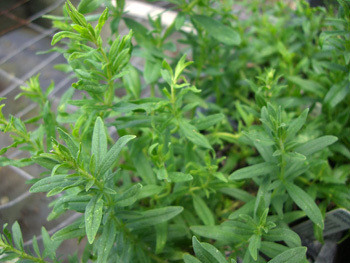 Grows wild in warm countries, dry soils, and frequently cultivated. Introduced into the warmer parts of the United States from southern Europe. Native to Europe and temperate Asia. Anthelmintic, aromatic, aperient, astringent, carminative, emmenagogue (stimulates menstrual flow), febrifuge, anti-inflammatory, anti-viral, antispasmodic, expectorant, stimulant, diaphoretic, stomachic, sudorific, tonic. Herbs were well known in ancient Egypt. And in the Bible, Exodus 12:22, “And Ye shall take a bunch of hyssop, and dip it in the blood that is in the basin, and strike the lintel and the two side posts with the blood that is in the basin; and none of you shall go out of the door of his house until the morning.” Scholars believe the hyssop of this reference is Origanum aegyptiacum rather than Hyssopus officinalis. David, of the Bible, knew the benefits of hyssop. He drew lessons from the remedy, which he used in showing the cleansing of the body from sin, for he said, “Purge me with hyssop, and I shall be clean; wash me, and I shall be whiter than snow” (Psalms 51:7). Planted as a companion to cabbage (deters the cabbage moth) and grapes. Keep away from radishes. Hyssop is an herby fragrance used in Chartreuse, Benedictine and other liqueurs. Hyssop is historically known as a holy herb, used for cleansing sacred places. Hyssop is a name of Greek origin, adopted from the Greek azob (a holy herb), because it was often used to clean the temples and other sacred places. A cleansing herb, relieves catarrh, cough, and reduces the secretion of mucus. Regulates blood pressure (high or low), clears the chest and calms the nerves. It promotes sweating, so this herb is useful when coping with fevered patients. Improves digestion and protects the body from infection. An excellent tonic. Hyssop is used in essentially the same way as sage, with which it is sometimes combined to make a gargle for sore throats. Hyssop tea can be used for poor digestion, breast and lung problems, expels worms, gravel in gall bladder, conjuncivitis, fever sores (fever blisters), chew dried leaves for toothache, used with horehound for bronchitis and asthma, coughs due to colds, nose and throat infections, consumption, mucous congestion in the intestines, laxative, cystitis, flatulence, scrofula, dropsy, and jaundice. The decoction is said to help relieve inflammations, and it can also be used as a wash for burns, bruises, ulcers, or chronic catarrh. Apply the crushed leaves directly to bruises or to wounds to cure infection and promote healing. Experimentally, extracts are useful against herpes simplex. Effective on insect stings and bites, kills body lice. Do not use continuously for extended periods. Harvesting takes place when the first flowers are about to open. The oils and flavor off all herbs are in the leaves and green stems and not in the wooden parts. Drying usually completed in 2 days. Hyssop tea is made by pouring a pint of boiling water over an ounce of the green tops and is considered excellent tasting. Infusion: steep 1 tsp. dried herbs in 1/2 cup water. Take 1/2 to 1 1/2 cups per day, a mouthful at a time. For breast and lung problems, sweeten with honey if desired. Prepare a standard infusion of the leaves and diced stem. As a lotion, this brew relieves inflammation and bruising, being noteworthy for its beneficial effect on black eyes. Decoction: use 1 tsp. herb with 1 cup water. Take 1 to 2 cups per day. Poultice: soak the fresh herb in boiling water for 15 minutes and place on a cloth for application. Poultice: soak the herb 15 minutes in boiling water and place on a cloth. The essential oil contains the ketone pino-camphone, which in high doses can cause convulsions. Do not take more than the recommended dose. Do not take for more than 2 weeks without seeking medical advice.